The birth chart of the Presidents or the Kings can be consulted like universal one’s in world astrology for their countries and more still for the “World Number One”. We must understand that they have not any direct responsible with the exposed facts. March 10, 2000, Nasdaq reached its historical top 5.048, 62 points! In thirty and one months, it will undergo an important fall (78% of its value) causing a bankruptcy of many investors of new technologies in the world. 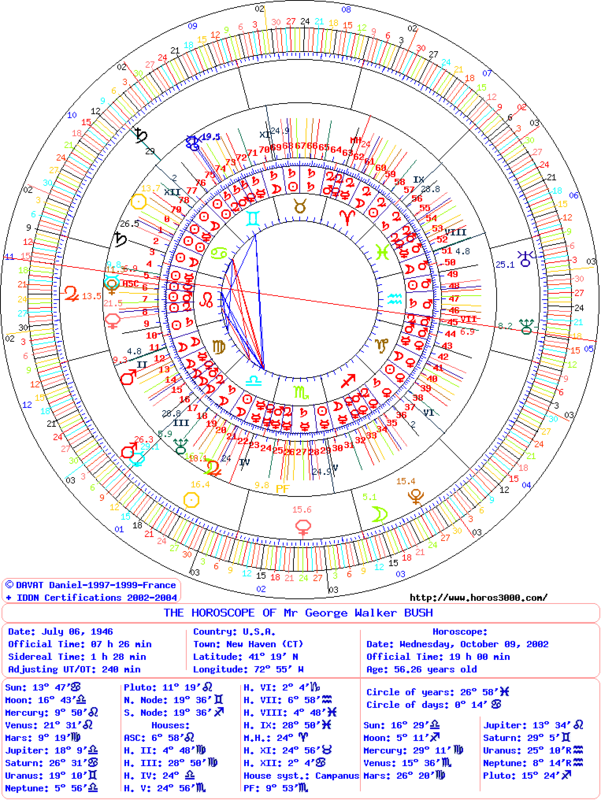 Point of convergence of the circle of the years: 26°58′ of Pisces on a degree pertaining to Saturn (26°31′). This sector has a feeble force in the end of House VIII. Position of the degree of the day: 0° 14′ of Cancer which undergoes a Saturn transit (with 1°09′ near). This sector of powerfull force is united with Sun. The planetary period is that of Saturn which at its position has a very evil quality in Cancer and a very powerful force (joint with the Sun and Ascendant). The degree of the year positions on a point of convergence of Saturn which has a evil quality in Pisces in House VIII. On october, 09 2002 corresponds to 0° 11′ of Cancer. It undergoes a Saturn transit. This degree has a conjunction with the Sun which is itself under the influence of a conjunction with Saturn of very evil quality in Cancer. The crash of Nasdaq took place in the most difficult sector of this horoscope, the sign of the Cancer occupied by the conjunction Sun-Saturn and under the quadruple harmful influences of Saturn! The financial sphere is under the control of Mars that is situated in House II (finances) and governor of House V (speculations) and of the Part of Fortune. Mars has an evil quality in Virgo. It took place in the degree of Saturn (26°) on October, 09 2002 (Mars transits at 26°20′ of Virgo). On December, 08 2006 the cotation of the Nasdaq was at 2443 points. This entry was posted on Thursday, July 12th, 2012 at 10:07 pmand is filed under Finances. Both comments and pings are currently closed.